This work was inspired by the traditional Japanese Yukimi Syoji screen commonly used in rural houses. Yukimi means watching a snow scene, and Syoji means paper door. 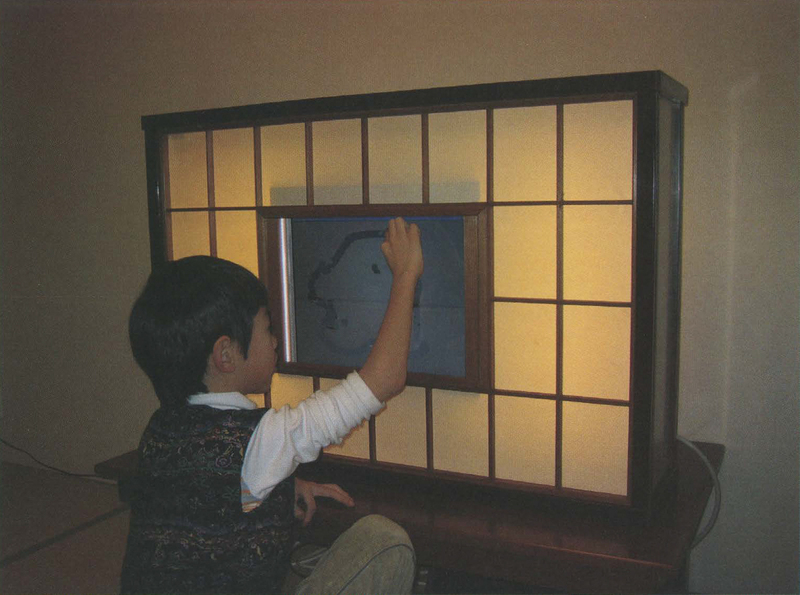 On a Yukimi Syoji, paper is replaced by transparent glass so people can view snow scenes. I am deeply impressed with this enjoyable way of spending time. When I started producing this installation, the first thing I did was make a covering box like a Yukimi Shoji to hide computer devices. Next, I created three types of snow scenes by programming with OpenGL and C++. I created snowflakes in four-dimensional hexagons, letting them move and rotate in four-dimensional space, and projected the snow scene to three-dimensions. Second, I created a scene of snowflakes in the form of alphabets. I set a slow falling speed so that people could read the alphabets and even solve a word puzzle. Third, I made a snow scene in which everything (for example, snowflakes, trees, and houses) was shown in wireframe. These floating wireframe snowflakes present a novel and particular sense. In addition, I created a virtual cloudy glass and put it in front of the snow scene. When people touch the panel and move their fingers, a transparent stroke appears on the virtual glass. Through the stroke, people can see the falling snowflakes. With time, the stroke disappears, and the glass becomes cloudy again. coordinates, and composed of semi-transparent polygons. Snowflake movement is controllable through parameters such as falling speed, floating vectors, and rotations.